The Visual Science Lab / Kirk Tuck: OT: VSL acquires new vehicle for its celebrity owner.... Aston Martin? Bugatti? Bentley? Click Baitmobile? OT: VSL acquires new vehicle for its celebrity owner.... Aston Martin? Bugatti? Bentley? Click Baitmobile? I also want a car that's filled with safety features so I can dodge as many crazy drivers and weird, Texas highway situations as possible. The Honda CR-V (thanks for the years of mostly trouble free service!!!) was a good photographer's car. I enjoyed driving it but it's aged out of modernity and needed to be updated. Also, cars tend to get sloppy over time and I was starting to hear squeaks and rattles that sounded as though they might presage some future maintenance with which I would not want to deal. I test drove all the small SUVs in the category I think is most effective/efficient and still fun. That includes: the Toyota RAV4, the Mazda CX-5, the AWD CR-V from Honda, the VW Tiguan and even a Mini-Cooper Countryman. But the very last car I test drove was the Subaru Forester. It felt the best. It had the most solid ride, had the best interior layout, and comes with a great reputation for reliability and safety. I test drove one on a Saturday and then sat down with a sales person to configure my version. All Foresters have the same engine and drive train. You can spend $25K or $35K but you will get the same overall performance. The only options that affect handling are the tires and wheels. I have had my fill with sun roofs, moon roofs and other useless holes cut into the tops of cars. I don't like them, don't use them and don't want them. I wanted a solid roof. The car is white. Pearl white. The interior is light gray. I live in Texas and anything I can do to diminish the heat load is a very good idea. That's also why I am adding UV and IR blocking window tint. The interior space is perfect for a photographer. The lack of a moon roof adds almost an inch and half to the interior height. The rear seats fold down quickly and easily and almost completely flat. A cargo net comes standard. There are ample tie down points in the cargo area. The cargo area and rear seat backs are finished in a thick, black rubber-like material that should hold up well when confronted with big Manfrotto gear cases, gear carts and loose C-Stands. It's not a race car but it holds its own on the freeway and still gets about the same gas mileage as my old (non-AWD) Honda CR-V. Of course, it's all wheel drive and has the standard 185 horsepower motor and a 7 speed CVT. over the last 13 months. I was starting to have Palovian episodes of depression every time I got in the car lately since it's been the facilitator in my journey of heavy responsibility and, well, grief during the hardest parts of my recent life. The new car is like a clean sweep. I'm starting from scratch. I'm also starting to rotate cars for trips to San Antonio. Sometimes I'll borrow my wife's Subaru Impreza for the trip. On rare occasions I'll borrow Ben's Toyota Corolla. For bigger business meetings, house sale closings, etc. I generally rent something for the day; like a Suburban or an Audi. I don't want to put the burden on just one car anymore. The Honda bore the brunt of my long 2018. I'm handing it off to someone for whom its baggage doesn't exist. I have my first location shoot tomorrow. Not a lot of gear but a fun, local introduction to the car in its support of a photo shoot. I'm already happy. Least favorite feature: the engine shuts off at stop signs and stops in traffic in order to save on gas. My most favorite feature: the button that turns off the "feature" that shuts off the engine at stops. Best interior feature: The driver's seat is great. Some it the visibility. Back to our regularly delivered programming. I've been driving my 4th Gen (SJ) Forester with the 2.5L NA engine since 2013. Coincidentally mine is also Pearl White, a concession made to my Australian wife who prefers white cars for the same reasons you do - heat reflection. Of course, living in the middle of Alberta, Canada, that's not my top concern. I'm approaching 80 000 km with no issues other than routine maintenance. At the time we chose it due to it's superior visibility out the windows, AWD, and cargo volume. I have owned 2 Mazdas, but the CX5 of that era was more style than substance, with blind spots over the shoulder and a sluggish automatic transmission hampering the pep of the Skyactiv engine. Note that the CVT transmission doesn't have any "speeds" per se, since it's uses two cones to generate variable gear ratios. The manu-matic paddle shifters just slot the ratio into electronically predetermined positions along the spectrum. I find it useful to downshift when passing big rigs on the highway, since you can get the revs into the powerband and enjoy immediate throttle response. The newer CVTs are less laggy than the old ones, but there's still a vague slingshot sensation when pushing down the pedal. Anyway, enjoy the Fozzie. It was the first *new* car I have ever purchased, and after labouring under monthly car payments, I am in no hurry to replace it. Since the majority of my previous vehicles came into my possession with over 200 000 km on the clock, I'm hoping I can drive mine for quite a bit longer. Excellent choice. I've been driving Subarus since the late '80s and they just keep getting better. My current one (2 years old) is a Crosstrek, probably too small for you but it handles awesomely. Congratulations. The engine shutdown certainly makes sitting at a red light quiet. My Prius does that, and it took a little getting used to, but its 45-50 mpg is a blessing to a retired teacher. Surprisingly the interior space is almost the same as a subie, but there’s zilch for road clearance and the absence of AWD is noticed in rainy conditions. All my old Foresters wound up in the hands of relatives in Wisconsin, where the subies handled wintry conditions well. The wife currently drives a ‘12 Impreza wagon, and the dimensions are perfect for her. Don’t know if Toyota still owns a sizeable chunk of Subaru shares, but when they decide to put a Toy engine in with the Subie AWD system so that the mpg is a legit >40, then I will be a prospective buyer. The flat fours have their advantages but have never been the very best on mileage. On the other hand they are free revving and plenty peppy for urban commutes. Think you will really enjoy it. We upgraded to a Forester from a Toyota Matrix a couple of years ago. I love the view in all directions. It's probably the most visibly open vehicle I've ever owned. 1) The "almost flat" cargo area. Why? The Toyota Matrix was perfectly flat when folded. Why can't Subaru do the same and get rid of the annoying hump that you have to push stuff up and over when loading. Maybe the 2019 version is better? 2) I find the reflection of the chromed vent trim a distracting reflection in the driver side window right over left side mirror, especially in bright sunlight. I've thought of buying some flat paint in the exact same interior dash color, but not sure I'd get away with it since it's technically my wife's car. 3) For some reason, the 1/4" of undimmed perimeter on the auto-dimming rearview mirror is where 95% of the headlights following me seem to shine. I'd go back to the manually controlled mirror until they figure that out. Those are all very minor annoyances. All-in-all, the car's great! Much better on the highway than the Matrix in terms of comfort, which is what we were after. Good luck with yours! Congratulations, Kirk. A very solid and practical vehicle, I must say. Those Subarus with their all-wheel-drive handle oh so well. I was almost going to buy a Subaru Legacy Sedan but decided to go more high-tech with a plug-in hybrid Honda Clarity. Sure you don't want to write an auto blog, Kirk? I enjoyed this immensely - your write-up plus pic has me sold! Don’t really understand the dislike for sun roofs. They have a blind when you don’t need them. As a photographer I assumed that having access to more light would always be a desirable option , even when driving ! I enjoy the huge glass roof on my Cherokee especially in the winter months. Your comment about sun roofs costing interior space is right on the money, as I quickly realized when loading my stuff into my Hyundai Santa Fe some time ago. The other disadvantage is that the interior dome light is by necessity clear back into the luggage area, and throws no light at all into the front seat area. My wife drives a 2016 Forester, and my next vehicle will be one as well. They aren't flashy, but Subaru does all wheel drive right. Kirk, we're pushing 50K miles on our trusty 2016 "Fozzie" (love it, thanks Craig). It has been on multiple family trips now, across 11 states and all varieties of weather. Subaru's AWD is the best in class, there simply is no better when the roads get messy. Note on oil changes to ensure it doesn't get overfilled, this has been an issue a few times and has an adverse affect on mileage. Runs on anything labeled "Gasoline", so don't waste money on premium. You'll get to where you love the cadence of the flat four and other cars just won't sound quite right. Enjoy! 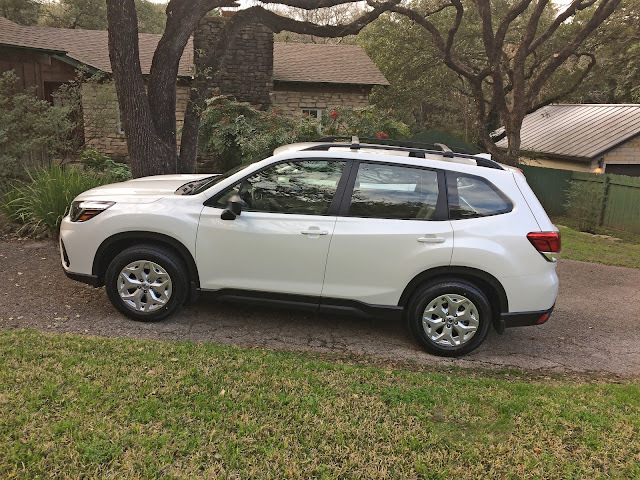 I came very close to buying a Forester recently – but then opted for an Outback instead. There are things I preferred about the Forester, but I preferred the more car-like Outback overall. Subaru is a bit more niche in the UK, so it wasn't so easy to find the car I wanted, but I'm happy now. I might miss my old Alfa a bit though. I think Subaru really has the solid ride thing down. Didn't realize this until I rented a Camry after driving my Legacy for a year. But there is one weird thing about the CVT transmission that I hope they have improved in your new car. When you switch from reverse to drive you have time to check Facebook before it engages. It's not a getaway car. Great minds, etc. I've been watching the Forester for some time. I've driven Toyotas (Corolla, Camry, Highlander and Tacoma) for many years, but think I will switch to Subaru soon. I've been hoping for an improvement on the current Subaru "Eyesite" system, which uses video cameras and is "blind" in heavy rain and snow--when I need it most. I would prefer a true "radar" system such as the Hyundai has on the high end sedan. You picked the color combo that my wife likes. I think you've got a great-looking and performing vehicle. "with which I would not want to deal" made me swoon,dawg. Which reminds me of Churchill's "That is a rule up with which I will not put"
Thank you my wise and noble blogger genius. I'm loving Photothunk. It's the smartest thing on the web. Buying a new car is a lot like buying a new camera. They're all pretty good, so you buy the one that makes your hands and heart happy. Well done, sir. I have a 2012 Forester in white (for the same reason - I live in Georgia). I went to buy an Outback but loved the visibility from the Forester. Added to that, it was less expensive, allowing me to upgrade on options. Over 80,000 miles with routine maintenance, tires at 60K and a battery at 80K. I previously had a CRV but could not get comfortable in the seats. I got a second hand Forester for my daughter as her first car. It lasted and lasted, even if subjected to less than ideal driving skills. Then it went to my son, who drove it for a few years. Now it's for sale but still purring along. These things are made to last! As we say around here: the only way to kill a Soob Forester is to shoot it. And here's what I like, every comment was in support of your decision ... pretty sweet in the times we live in. Thank you everyone! Amen on sunroofs. They are a hole that will leak. In my part of the country, Subaru drivers have a reputation as being slow drivers, and I certainly seem to have had a disproportionally large number of Subarua in front of me going really, really slowly (30 mph in a 50 mph limit, for example). So I have a prejudice against them, but I am sure you are not one of those drivers, Kirk. Congratulations on the new Forester. We just took ownership of a 2019 Outback two weeks ago -- it took 2 months to get the configuration we wanted. I didn't mind waiting. We liked both the Forester and Outback but had to choose and finally decided on the Outback. Still learning about all the EyeSight features and everything else. It's a lot more complex than the 2007 Subaru Outback I just traded in. I've owned a 1982 Subaru GL (137K miles), a 1997 Legacy (~180K miles), and the 2007 Outback (236K miles). My wife is still driving her 2005 Impreza (115K miles). I've recently been searching for a replacement for my 12-year old SAAB wagon (that has served me so well) and my short list mirrored years for the most part. I went so far as to do an on-line build for exactly the car you selected - same model, same color, same trim level and options, but the one thing I couldn't have in the base model appears to have been available to you after all. You described selecting upgraded seats. Would you mind describing what you got and how? Much appreciated. When my Honda Element died (brake failure), I looked around and bought a 2015 Subaru Forester. I live in Massachusetts, and I needed all wheel drive for snow conditions (my wife who is a better driver than me could manage with her rear wheel drive Mustang, but I had gotten stuck a few times with previous cars and vans). I occasionally need room to carry stuff and we do road trips every so often, so a normal sedan would not work for me. My father recently sold his house to move into a retirement community, and downsized a lot of stuff. I was able to pack the Forester to the gills with the stuff we took back from Illinois to Massachusetts. Like you, I hate moon roofs, but in order to get the eyesight package at the time I bought the car, I had to 'upgrade' to the model that includes the moon roof, but I've never had it open in practice. Our 19 year old Subaru Forester has 130K on it and still peps up without complaint. Only two things went wrong: the moon roof stuck shut at 60,000 miles and the dealer couldn't fix it (!) and the wheel bearings gave out at the same point. Not too shabby a performance record. The AWD has this way of rolling through standing water on Hiway 101 during rain storms - - just as one tire breaks free to slew sideways, the AWD kicks in and the car waggles its tail and rights itself. The sensation is as if a cat extended its claws and caught its balance after slipping on linoleum. I'm sure this anti-hydroplaning function of Subaru all-wheel-drive has saved my life more than once. I wonder from the comments so far why buy an SUV for the next 6+ years isn't more like buying a camera for the next 20-100,000 shots. (i.e. 2 years or less). Don't they all do what you need at a cost a bit above what you'd like to pay? Israel (here) is not Texas, so once you've chosen a car with the right number of seats (2, 4-5, or 7) and carrying capacity, the remaining questions are cost (sometimes there are deals) and which dealership can be trusted to get the maintenance right in one pass per year once the car gets older. We keep them 10 years, so that last factor is usually decisive. The Start Stop was driving me crazy on my Skoda since the car would release the clutch to start moving before the engine had completely woken up which made for a very shuddery start. No update was available to fix this so I disabled the feature altogether in software. We need to move on from all this talk about non-cameras! For a second there I thought I had opened TOP when I saw a car!